Another addition to Xiaomi's budget stockpile, the 4X is also one of the latest additions to the company's Redmi series of smartphones. The phone was unveiled alongside the company’s Mi 5c smartphone, which is its first offering featuring its own chipset. Specifications-wise, the phone features a 5-inch HD display that is protected by a 2.5D curved glass on the top. It is powered by a 1.4GHz octa-core Qualcomm Snapdragon 435 SoC that is supported by an Adreno 505 GPU. Furthermore, the phone is available in a couple of RAM (2GB/3GB) and ROM (16GB/32GB) variants. In order to keep all of this up and running, Xiaomi has made way for a mammoth 4,100mAh battery that keeps it alive and according to the company, can last two full days and has a 15-hour continuous video playing capacity. The Xiaomi Redmi 4X (3GB RAM, 32GBROM variant) best price in India is expected to be around 8,799INR. You can subscrobe to Smartprix to get the latest news, alerts and notifications regarding the Redmi 4X. 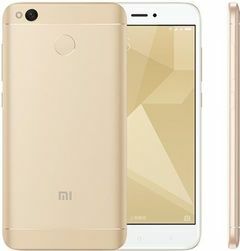 My phone Redmi 4x VoLTE Not working After Mobile update.